I first found out about the 3-Zigma microphones at the NAMM show in January, 2009, when 3-Zigma cofounder Larry Villella pulled a multi-capsule stereo set out from under the table at his ADK booth to show me. “Lipsticks and lollipops, all in one!” he gloated. I wanted a set immediately. 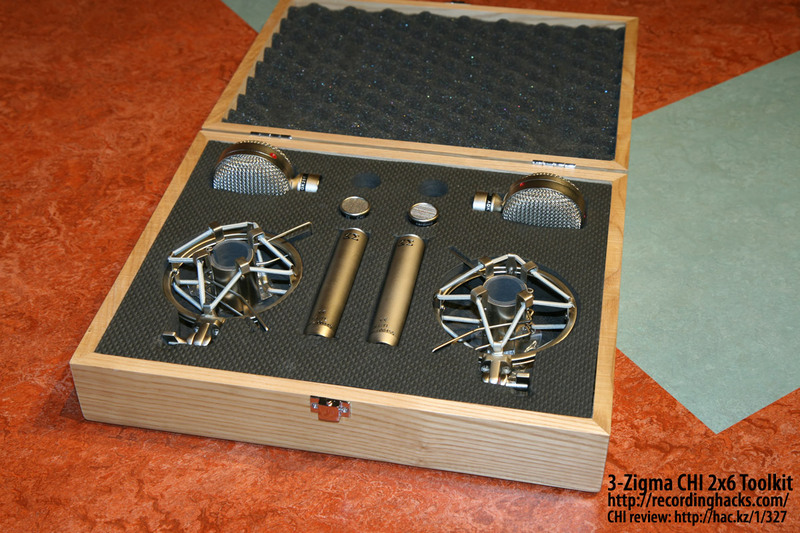 Larry provided a loaner set of 3-Zigma mics for review, from the first batch off the production line. I used them on a couple projects, and loaned them out to several area studios for additional perspectives. At long last, here’s our review. The CHI mic system currently consists of a separate “head amp” and a collection of eight interchangeable capsules. The SDC end-address capsules provide Cardioid, Hyper, and two flavors of Omni; the four LDC side-address capsules are all cardioid, but colored to evoke the timbre of the Neumann U-47, U-67, AKG C12, and Telefunken ElaM 251. 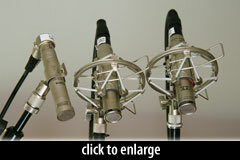 Read more about the CHI mics’ design intent and specifications in the mic database. The mics are beautifully packaged in foam-lined wooden cases, with diecuts for the head amps, shockmounts, and multiple capsules. The review set contained two stereo kits: four head amps, the GK12 and GK47 LDC caps, stereo pairs of the GK251 and GK67 LDC caps, stereo SDC cardioid caps, and stereo SDC omni caps. The mic bodies and capsules are solidly built, with a uniform silver satin finish. 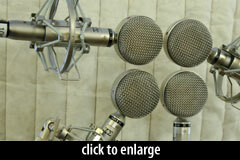 They’re all heavier than comparable mics, due to the use of heavy-gauge brass bodies. All the pieces feel good in the hand. The mic bodies are engraved with the mirror-image 3-Zigma logo, a serial number, and the model name HA-TL (meaning “head amp – transformerless”). They look good. The testers and I experienced a couple niggling usability issues, which I’ll mention only briefly because they’ve all already been addressed by the manufacturer. Briefly, the initial (2009) production run of CHI mics used brass bodies. The capsule-mounting threads were a bit too delicate, and on that first turn seem to be on the verge of crossthreading. To be fair, none of the testers ever actually crossthreaded a capsule, so the risk is more perceptual than genuine. Also, the LDC capsule heads are both hard to distinguish (they are identical, save for a tiny model number printed on a decal) and hard to orient (in that the ‘front’ is indicated only by a small engraved Cardioid symbol). More than one of the testers inadvertently put up a mic backwards. Finally, we found that the shockmounts don’t grip the mics tightly enough. We worked around the problem by wrapping the mic bodies with rubber bands. Larry informs us that the 2010 production run of the CHI system will use a redesigned chassis for the head amp, machined from stainless steel. The LDC capsules will be more clearly identified. And the new shockmount design won’t slip. We’ll have more CHI news soon. In the meantime, let’s get back to the review. I was initially tempted to compare each of the LDC caps to their sonic ancestors. I could have corralled four vintage tube mics for a “shootout,” but such a test wouldn’t tell us anything we don’t already know. 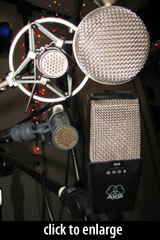 The CHI mics are not presented as recreations of these vintage tube mics. Rather, they are presented as differently-colored paintbrushes, and the sonic colors are named for common historical references. This is akin to naming a hue “forest green” rather than “green #12.” One puts a picture in your mind, and the other does not. So, we used the CHI mics like you’d use any other microphone: however and whenever we could, on a variety of sources. To get an initial impression of the CHI, I put on the SDC Cardioid capsule and hung it side-by-side with my go-to SDC, an OktavaMod MK-012. 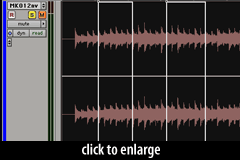 Speaking into both mics, I found that the MK-012 sounded a bit more open, but not quite as full in the low mids. The CHI sounded cleaner and more focused, and a bit more compressed. Curiously, the frequency-response graphs for these mics suggest that the MK-012 would have a much more pronounced LF response, but this was not the case in my testing. For example, when I pointed both mics at my best source of low-frequency information, a 22×16-inch kick drum, I could not hear a difference between the two mics. But my spectrum analyser showed that the MK-012 rolls off faster below 30Hz than does the CHI. This is not likely to be an audible difference on most playback systems, but goes to show that published frequency graphs are not entirely predictive of real-world performance. Next, I put up a pair of the CHI mics and a pair of the modded MK-012s (all four with small-diameter cardioid capsules) in a coincident (XY) stereo arrangement above a hammer dulcimer. Listening back, I got a surprise: the mics sounded nearly the same! In fact, I couldn’t distinguish them after repeated playbacks. Hoping to reveal the sonic differences, I gain-matched the tracks and intercut the tracks. You can hear the result below. I hear subtle differences — the CHI is fuller in the low mids — but the differences are not enough to blindly identify either mic, on this instrument anyway. In this sample, I can only hear one of the transitions. Above a drum kit, the CHI SDC with Cardioid caps again sounded nearly the same as the modded MK-012, to my ear. The CHI SDC-C and MK-012 are closely matched in output level. Self-noise profiles are functionally equivalent too. The bottom line: both these SDCs present a wonderful blend of accuracy and warmth, with smooth and non-fatiguing highs. I’ve always loved the modded MK-012, and the fact that the SDC CHI sounds a lot like it makes it a winner. I next compared the SDC Cardioid CHI to two other small-diaphragm condensers that I like less well, the Audio-Technica AT2020 and the AKG C1000S. The AT2020 sounded hyped in the high end, and tended toward sibilance on my voice. The C1000S sounded thin, distant, and insubstantial. The CHI sounded better than both — more intimate, more natural, more pleasing — and for my applications, would represent a significant sonic upgrade. The C-LOL-12 and C-LOL-251 capsules are edge-terminated, whereas the C-LOL-47 and C-LOL-67 capsules are center-terminated. The ‘251 diaphragm is 3-micron Mylar; the rest use 6-micron Mylar. Backplate drilling patterns are all different. Backplate spacing and diaphragm tension are almost certainly different (I assume). …but they are all the same size (27.5mm), and use identical headbasket and grilles design. I hung all four LDC caps in a tight cluster and recorded my own voice, with a distance of 10 inches and no pop filter. On playback, the differences are subtle, but of course my monotone voice is not pushing on the edges of the frequency spectrum. Nonetheless, I think this is a useful baseline. I can hear the extended high-frequency response of the GK12, the “weight” of the GK251, and the more colored response of the GK47 and GK67. On drum overheads, I was surprised to not hear more significant differences from these capsules. For example, I would have expected the GK67 to sound somewhat darker and more mid-forward than the GK251. I can hear that, but it’s subtle. For reference, I tracked the same performance with a pair of CAD M179s, a neutral multipattern LDC set to Cardioid for this test. Next, I set up all four CHI LDCs in a line above the hammer dulcimer, again with the CAD M179 as a neutral reference. The following tracks are from a single performance. The M179 sounds rounder, with less impact from the hammers. All the CHI capsules pick up more of the transients of the hammers hitting strings. The C-LOL-67 is warmer than the C-LOL-47, and has less top end than the C-LOL-47. The C-LOL-12 is the brightest of the bunch. The C-LOL-251 seems to pick up less of the resonance of the instrument, less of the woody sound of the body. So, close listening reveals differences, but they, again, are more subtle than I would have expected. But what I found in later testing is that the EQ curve differences among these capsules would often make or break the track. 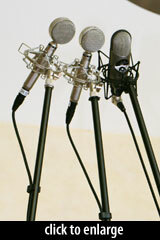 That is, when we recorded guitars with these mics, we’d often find that one of the four capsules clearly sounded better. And it wasn’t always the same one. 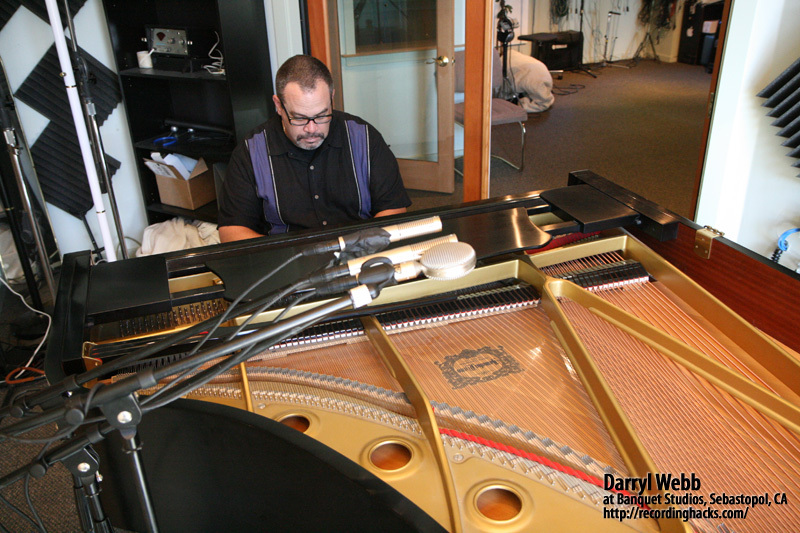 Sonoma County composer and engineer Darryl Webb used the CHI mics on a few sessions with excellent results. Darryl provided samples of the CHI mics on drum overhead, banjo, B3, and acoustic guitar, which I’ve included below his comments. 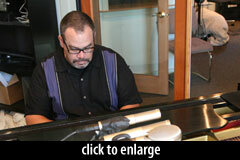 These samples were recorded at Sebastopol’s Banquet Studios and Calistoga’s Silverado Records. Overall… I like the “vintage” sounding capsules a lot. They are warm, natural, with the characteristics of earlier mics, but without the noise associated with earlier mic designs. I especially liked the CHI 67 and 47 capsules. The 67 pair seemed perfectly suited for B3/Leslie speaker… punchy, warm and quiet. In the past, we had used AKG 414 pairs, and also a configuration with a TLM-103 on top and a U-87 below. The artist that we used the 67s for said that the CHI 67s gave the best B3 sound he had ever heard. The 47 worked well on the low-end of a Yamaha C7, and also added warmth to banjo, yet retained clarity in the higher frequencies. I liked the CHI SDC cardioid pair on acoustic guitar, with one at fret 12 aimed at the hole, and the other at the tail aimed up toward the bridge. They performed magnificently. I thought they were similar in character to the KM-84, but with a slightly elevated HF curve, more accurate response in the low mids, and of course, extremely quiet. I did like the CHI small-diaphragm Omni pair as additional drum overheads. They provided an additional openness to the space around the drum kit, and gave an accurate representation of the tones of the kit. With no question, all of the mic capsules were high quality. The only issue I had was that it was tricky getting the caps on, due to the delicate threads on the mic body. This was especially a problem with the larger heads. The other is just a minor issue: even though the mics come in a beautiful wooden presentation box with padding, it is not a flight case. I travel with my mics for location recordings, and having them in a case that you can easily carry and open for airport security inspections is a must. The last thing I’ll mention is that with mics that sound so good, it is too bad you cannot use all of them at once… and although this is a great idea (multiple heads and one body), I would eventually probably want to get more bodies to be able to use more than two heads at once — and that defeats the purpose of the interchangeable heads. But at the end of the day, what matters is how they sound… and they sound good. Darryl Webb recorded himself playing banjo for this test. 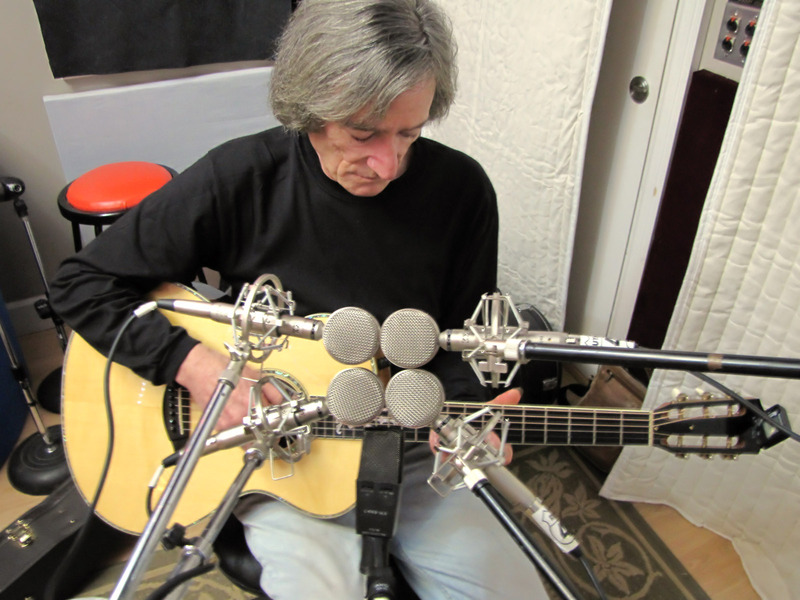 Darryl tracked Patrick James Flynn playing the acoustic guitar, with a pair of CHI microphones and the small-diaphragm cardioid capsules. Tracked with the C-LOL-67 LDC capsules, one on the rotating horn, and the other on the bass driver. The artist is Patrick James Flynn. 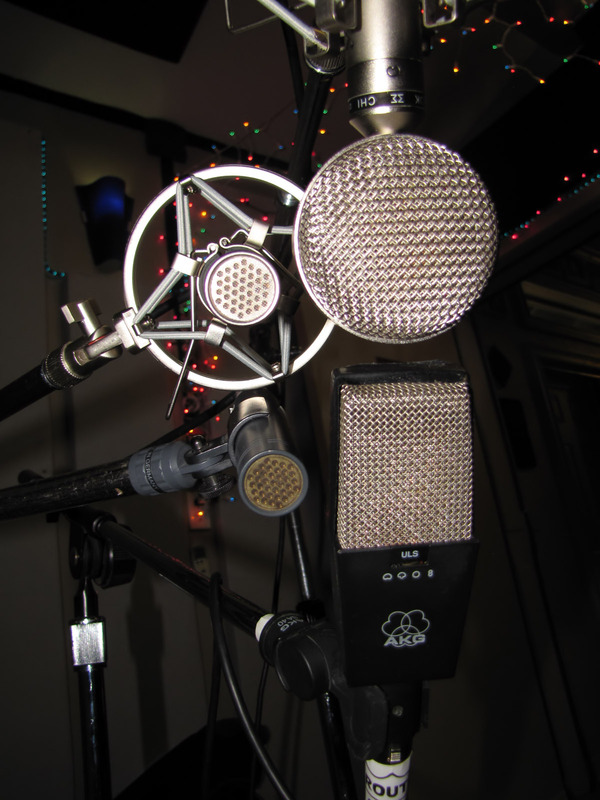 Darryl tracked Aaron Haggerty, during a session for an upcoming album by Saffell, with two pairs of overheads: vintage AKG C-451, and the CHI with small-diameter Omni capsules. This was not a shootout; in the final mix, both overhead tracks were used, at nearly-equal gain, with the Omni CHI adding ambience not present in the cardioid 451s. Harry Gale’s Route 44 is a cozy studio near Sebastopol, CA. 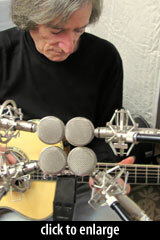 Harry used the CHI mics on a variety of guitar and fiddle sessions. All the samples from the Route 44 sessions were recorded with the preamps built into the studio’s Soundcraft Ghost LE console, with no EQ or compression. 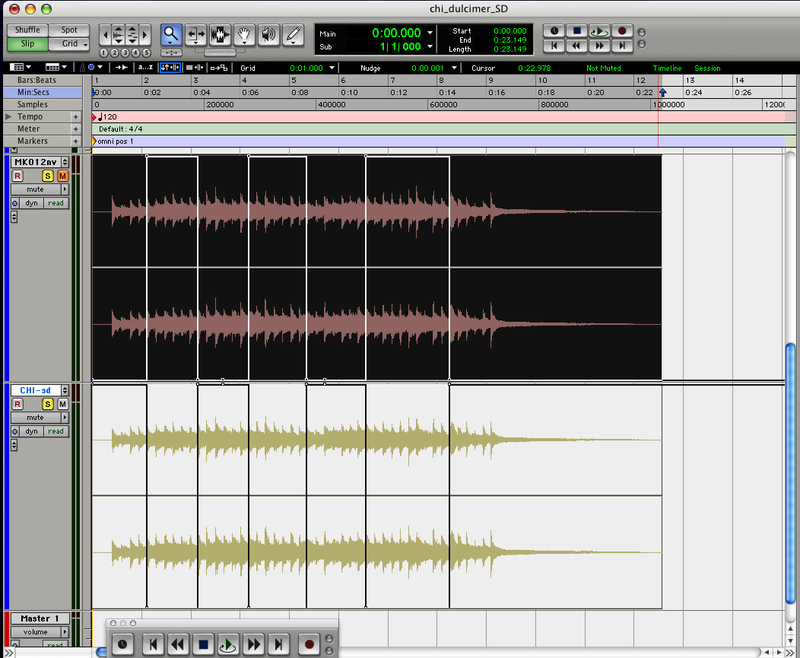 Within each session, samples have been gain-matched (RMS, not peak) within Pro Tools. We’ll withhold our impressions, so you can exercise your ears for a bit. The first session pitted the SDC CHI Cardioid against a Neumann KM-184 and an old SE1, on a fiddle overdub featuring Gus Garelick from local band The Hot Frittatas. The session was for an upcoming John Youngblood album. The track is called Fishing Blues. The next session was for guitarist Maury Manseau, who was in the studio tracking songs for an upcoming release. 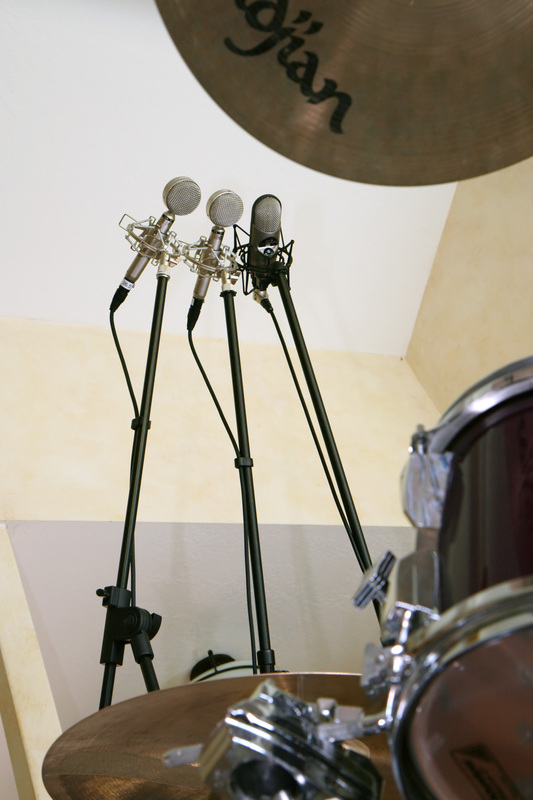 Harry set up a 5-mic array with all four of the LDC CHI mics, plus his own AKG C414 B-ULS. The track is called Wild & Free. For the next track, “Ordinary Miracles,” Maury played a Martin OM42 with dropped D tuning. Harry used a 4-mic array, with two SDCs and two LDCs: a KM-184, the CHI small-diameter cardioid, the CHI C-LOL-67, and an AKG C414 B-ULS. For this sample, we looped a 7-second excerpt; the order of mics in the following sample is: Neumann KM184, CHI SDC Cardioid, AKG 414, CHI C-LOL-67. The C-LOL-67 was slightly less “boxy” than the 414, maybe a bit crisper top end overall than the AKG, with much less self-noise. On Ordinary Miracles, I liked the 414 a bit better, due to the fact that that song has a drop D tuning and I felt that the low end warmth was realized more authentically. Overall the 184 took my first choice on Breeze, but the CHI-C was a close second for premium acoustic guitar clarity. I liked the understated high end of the C414, but on Breeze I thought the mic sounded muddy. On that track, I thought the KM-184 sounded focused but small. The C-LOL-67 was the most pleasing and engaging to my ear. The small-diaphragm CHI, which I like so much on other applications, came off as brittle on this track. On Ordinary Miracles, I again picked the C-LOL-67 as being the most balanced and intimate. I thought the KM-184 was too bright on this track. The small-diameter cardioid capsule with the transformerless CHI head amp makes a beautiful all-purpose SDC. To my ear, it bests the stock Oktava MK-012, the sE 1, and the Neumann KM-184. It sounded great on just about everything I heard it on. For my applications, the small-diameter CHI cardioid capsule is not a sonic upgrade from the modded MK-012, but on close-miked instruments I think the differences would be more audible, with the ‘best’ of course depending on the program material. In any case, anyone who owns a CHI head amp would likely find the small-diameter Cardioid capsule to be a very useful addition. Of the LDCs, I found the C-LOL-47 and C-LOL-67 to be the most colored, and to have the most character — and therefore would most often end up sounding either perfect for a track, or totally wrong. And to be clear, I consider that a benefit… Nobody needs a locker full of mics that all sound exactly the same. The C-LOL-12 and C-LOL-251 were less distinctly colored, but were unfailingly clean and articulate, with the 12 being brighter; I ended up thinking of these as “workhorse” sounds most likely to be useful in many contexts. In my testing, the character of the LDC capsules was most apparent when close-miking a voice or instrument. These capsules would not be my first-call mics for drum overheads, for example, but I think they really shine on acoustic guitar. If you record a lot of acoustic string instruments, having a selection of these CHI capsules available would make the CHI kit the first mic to reach for. They’re all very low-noise (7–10dBA), clean and articulate, each with its own subtle response characteristics. Just pick the one that complements (or tames) the instrument, and hit Record. One neat and unusual benefit of the CHI system is that more head amp and capsule options are in development. So, an investment in capsules now would become even more useful and interesting later this year, when the transformer-coupled FET head amp is released — and again when the inevitable tube head amp ships. The possible combinations grow quickly. In contrast, if you buy any single, non-interchangeable mic, it’s going to sound exactly the same no matter how many other mics you buy later. Similarly, more CHI capsules are in the works, so if you have a CHI head amp, you’ll be able to add more sonic colors to your palette for just the price of the capsule head. The CHI is not the first mix-and-match (interchangeable capsule) mic system. But it may well end up being the most versatile. Schoeps’ “Colette” system is currently bigger, with two analog head amps and 21 different capsules. But the Colette capsules are all small-diaphragm, and the FET head amp is available only in a transformerless design. Blue’s Bottle Rocket system, the Stage One (FET) and Stage Two (tube; these were formerly known as Red Microphones’ Type B and Type A, respectively) may be the closest current competition for the CHI system, albeit in a bottle rather than pencil-mic form factor. Blue makes nine capsules, which like the CHI’s are modeled after historical reference mics, e.g. 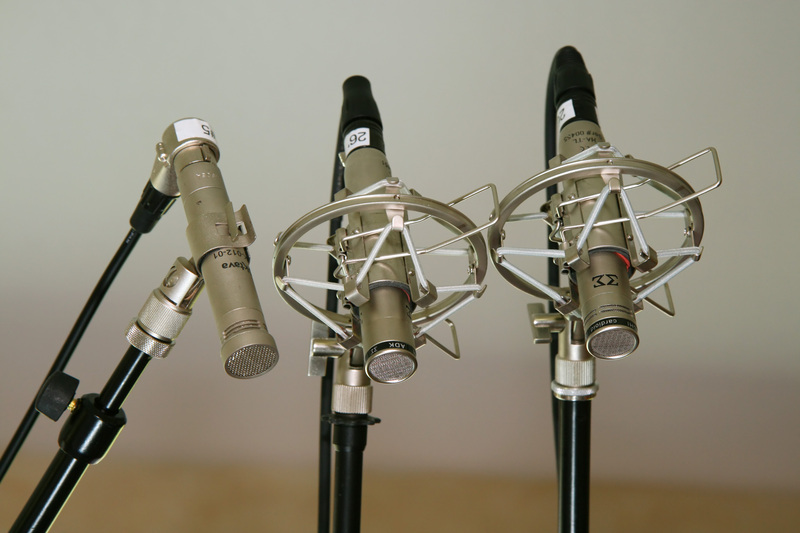 the B0 has an ElaM 251 voicing, the B6 has a C12 voicing, and the B7 has a U47 voicing. Due to Blue’s use of the old Neumann “bayonet” mount system, Blue’s two head amps are also compatible with vintage Neumann capsules, as well as a set of eight capsules made by Violet Design, and I think one by Flea. But Blue’s Bottle Rocket system hasn’t seen much new development in recent years, making it seem unlikely any new options will be added to the line in the future. The rate of development on the CHI system, in contrast, remains high, with numerous compatible products in the pipeline. If you like the sound of the CHI system, be aware that the best time to buy is right now. The new stainless-steel production run is not yet available, but the initial brass-body run has been declared “B-stock.” Until current dealer inventory has been sold out, you’re likely to find the CHI system available at a discount. I have no affiliation with ADK or 3-Zigma, and received no compensation for this review. The 3-Zigma products were loaned to me for review purposes, but unfortunately I don’t get to keep them. Hearty thanks go to Larry Villella of ADK/3-Zigma, Harry Gale of Route 44 Studios, Darryl Webb, and the artists who contributed their time and music: Patrick James Flynn, Aaron Haggerty, Maurice Manseau, and Gus Garelick. Kudos for a job well done Matt! Your piece really raises the bar for online gear reviews. What Michael said! I just found the site, and bookmarked it, and this is the first post I read. I am in heaven! I am just now starting build a mic locker, and this site will help me immensely. Thank you, for your time. Peace and good music, all! I loved the methodolgy for this review. I liked the references since they were mics that are used a lot in studios. The CHI system is a good idea for a studio on a budget and who isn’t these days. I think I will give them a try. Keep up the good work. Excellent review. I gamma tested the 3 Sigma CHI system two years ago. I enjoyed the mics quite a bit. Very nice to say the least. I just ordered a 4 x 10 set of the new stainless steel run, and should be getting them in about a month when they are delivered to the USA. Thank you for taking the time to put this review together. 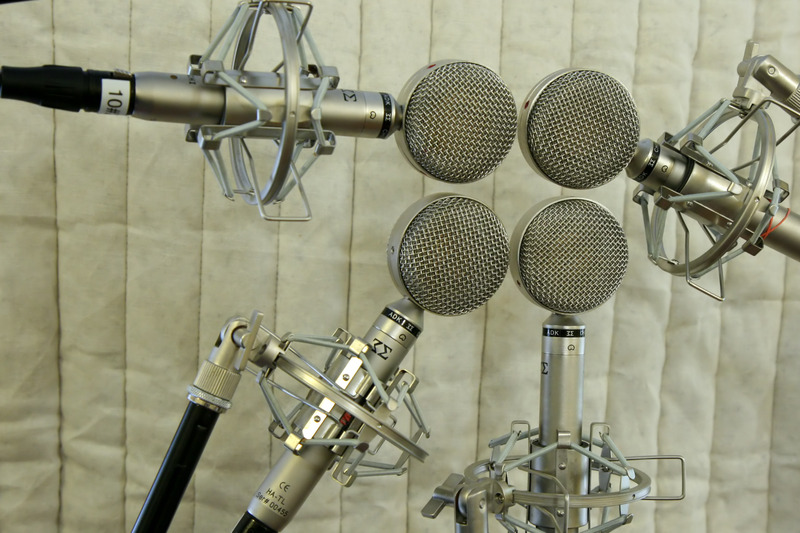 I have a pair of the CHI cardioid mics and one of the GK251…and love them! I am wondering if there is any chance we could hear the piano with the GK47 that Darryl Webb mentioned? 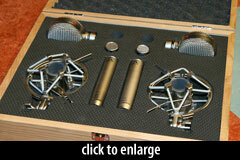 Rob, we’re hoping to get a set of the new stainless-steel CHI mics in for eval soon! I recently had a long conversation with Larry Villella at MUSKMESSE 2011, and just felt the need to express how refreshing it was to hear someone talk sensibly about his products, without hyperbole but by no means any false modesty. His products are very good, honest devices that could find a home in most studios. I have no affiliation with his company, however I probably will buy a kit having now tried them extensively. Excellent review by the way!